Use this guide to learn how to have impromptu online meetings and conference calls by using Microsoft® Lync™ 2010 communications software. You can use the Meet Now command to quickly start an online meeting and invite people who are either inside or outside your organization. Open Lync 2010, and, in the Lync main window, press Alt, and then click Meet Now. In the conversation window, choose the type of audio you want to use. To invite contacts from within your organization and federated organizations, click Invite by Name or Phone Number. To select multiple contacts, hold down the Ctrl key, and then click the contacts. To send a meeting request to someone inside or outside your organization, click Invite by Email. This creates a Microsoft® Outlook® email message that contains links to the online meeting. Depending on your organization, the recipient can join the meeting by using Lync, Microsoft® Lync™ 2010 Attendee, Microsoft® Office Communicator 2007 R2, Microsoft® Office Communicator 2007, Microsoft® Lync™ 2010 Web App, or Microsoft® Office Communicator Web Access. You can make conference calls to contacts you select in your Contacts list. You can also start a conference call from your mobile phone or from a new phone number, such as a hotel room phone when you are traveling. In the Lync main window, in your Contacts list, hold down the Ctrl key, and then click the contacts that you want to call. Right-click any one of the selected contacts, point to Start a Conference Call, and then click Lync 2010. In the conversation notification that appears in the lower-right corner of your screen, click the left pane. It takes only a couple of clicks to share your screen with a colleague in another location, give a formal Microsoft® PowerPoint® presentation, or share ideas on the whiteboard. In the Lync main window, in your Contacts list, double-click a contact’s name. When the conversation window opens, click the Share menu. Choose which monitors to share. Note: Whenever you’re actively sharing or presenting, a bar is shown at the top of the window that reads You are sharing. Sometimes you want to share only a single program and its windows. In the conversation window, click the Share menu, and then click Program. In the Share Programs dialog box, double-click the program that you want to show. Note: Whenever you’re actively sharing a program, a bar is shown at the top of the window that reads You are now sharing and a glow appears around the program window indicating what is being shown. On the sharing bar at the top of your screen, click the Stop Sharingbutton. When you start sharing your desktop, a monitor, or a program, you’re the only one in control. When you’re ready, you can allow others to use their own mouse and keyboard to navigate and make changes on your computer. You can take back control at any time. To allow anyone in the meeting to automatically take control of your computer, click Automatically accept control requests. To give control only to an individual, click the person’s name under Attendees. Note: If you choose an individual, this person can immediately control your mouse and make edits using their keyboard. If you choose Automatically accept control requests, people automatically get control when they click Request Control. On the sharing bar, click the Give Controlmenu. If Automatically accept control requests is selected, click it to clear it or, to take back control from an individual, click Take Back Control. Giving a prepared presentation to a group, you most likely want to control the content, pace, and what’s being shown at all times. In the Lync main window, in your Contacts list, double-click the contact’s name. 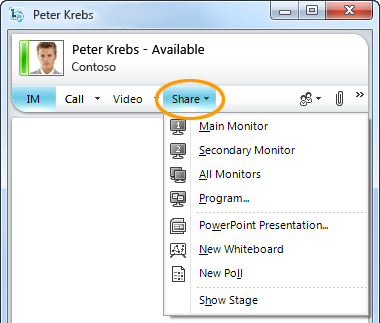 In the conversation window, click the Sharemenu, and then click PowerPoint Presentation. In the Present PowerPoint dialog box, double-click the PowerPoint presentation that you want to present. As soon as the content is converted and uploaded, the other participants can see your presentation. Note: Whenever you are presenting, a bar is shown at the top of the window that reads You are now presenting. On the sharing bar, click Stop Presenting. You can record online meetings, calls, and conversations. By default, recordings are saved to your computer at C:\Users\username\Lync 2010 Recordings. When you’re in a meeting, conversation, or a call, you can start recording. In the conversation window, click the More Options menu, and then click Start Recording. Click Start, click All Programs, click Microsoft Lync 2010, and then click Microsoft Lync 2010 Recording Manager. In the Microsoft Lync 2010 Recording Manager, click a recording, and then click Play. You can also export a recording that you can save to a shared location and send as an email attachment. In Lync 2010 Recording Manager, click Lync Recordings, click a recording, click Export, and then follow the steps provided. By default, the distributable recording is saved to the C:\Users\username\Lync 2010 Recordings folder.